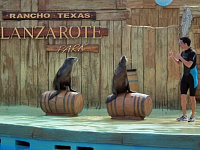 Rancho Texas Lanzarote Park is a theme park in Puerto del Carmen where you can discover a wide variety of flora and fauna. Open 365 days a year from 9:30 AM to 5:30 PM. 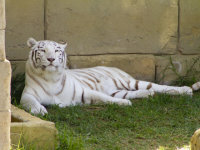 Here you can discover plenty of nooks and crannies including their citizens, such as the stunning white tigers or the Komodo dragon, parrots, birds of prey and sea lions. You can also find pony ride, or take a ride in a canoe on the famous Indian Pond. In addition, there are three dining areas with a wide variety of dishes, as well as the "Corral del Agua", a pool area with water slides where you can enjoy a swim! 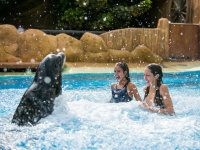 For adventurers looking for an unforgettable experience: Interaction with sea lions, a program in which you can get to know these fascinating animals. For this a reservation is recommended because there is a limited number of places. Children must also be at least 7 years here, and every child under 14 years must be accompanied by an adult in the water. In Rancho Texas Lanzarote Park you can also join a special night in the style of the Wild West cowboys and Indians to experience with BBQ buffet, Sangria, beer and soft drinks all the night ... There is also a variety of shows and dance choreography Tuesday and Friday (in July and August also on Saturdays) from 7:00 PM to 11:00 PM. Your nights can be different during your holidays!